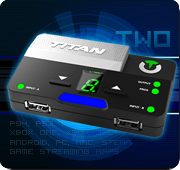 Titan One review by GimmeGimmeGames.com! We really appreciate the effort and time you spent reviewing our product, and we are grateful for your comments! “Ever wanted to play your Playstation with an Xbox controller? Or give your Xbox a go with one of Nintendo’s finer D-Pads? Well, you might want to check out the Titan One. It’s an accessory that costs as much as an extra controller for current-gen systems that allows you to use non-standard controllers on a variety of systems, wired or in some cases wirelessly. This may sound like blasphemy but the Titan One really does what it advertises once you get through setup, which takes a little longer than what you’d initially believe. 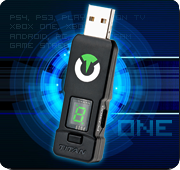 Titan One plugs into your PC or consoles (Xbox One, PS4, PS3, Xbox 360, PC) and tricks whatever device its attached to into thinking its a first party controller. So you can play The Last of Us Remastered with an Xbox One controller or drift in Mario Kart 8 online with the Dual Shock 4. As is, the Titan One is a really great accessory that is well worth the price of admission. It delivers on the promise of letting you use nearly whatever (recently made) controller of your preference on any console you want. So if you really hate the Dual Shock 3’s sticks and triggers now you can use an Xbox One controller to play all of your games. It would be nice if it supported multiple controllers for local play and the potential for online cheaters using the scripting engine doesn’t bode well for those who want to play on an even field. Still, its hard to argue with the price and core function of Titan One. Its probably the best $60 you’ll spend on an accessory for years. Anticipating the launch of Call of Duty Advanced Warfare, we are releasing the pre-launch Gamepack for this game, based on the CoD Ghosts Special Tactics. As soon the game releases, the final version of the CoD Advanced Warfare Gamepack will be specially tweaked and updated. Your feedback is very welcome! Please let us know how this Gamepack performs on the game and what we can do to make it perfect! Titan One owners can now enjoy the Blacklight Retribution Gamepack. Featuring rapidfire, secondary rapidfire, anti-recoil, turbo melee, easy sprint and more.